“Artificial intelligence” (AI). No, we’re not talking about the post-apocalyptic, superiority complex-inflicted, misanthropic machines you’ve seen in the Terminator and Matrix movies (not yet, at least). AI is the latest favorite buzzword in Southeast Asia’s startup ecosystem. PR folks use it as a catch-all term for technologies as wide-ranging as machine learning, natural language processing, and image recognition, among others. Nevertheless, these are at the center of a revolution taking place in the region and the wider world, and they are helping businesses to be more efficient, generate revenue from new sources, and improve access to things like transportation, healthcare, and educational resources. And it just so happens that Indonesia has all the right ingredients to be a perfect testing ground for startups looking to break into this revolutionary field. The fundamental element to this whole class of technologies is data. Without the collection of masses of data that can be analyzed and understood, the “learning” part of machine learning can’t happen. In the opinion of Sachin Chitturu, digital core leader for Southeast Asia at McKinsey & Company, this is where Southeast Asian startups face their biggest challenge. Value increases as scale does. Only a relatively small handful of Southeast Asian corporates possess the large customer bases that are preferable to test AI algorithms on. According to Chitturu, these typically fall into two groups: telcos, and fast-moving consumer goods (FMCG) businesses. Partnering with these types of companies is therefore a great starting point for AI startups, he added. It’s a virtuous circle. If startups have technology that can make the corporates’ lives easier by boosting efficiency or creating new revenue streams, then they become an attractive partner. As a partner, they can get access to the corporate’s large customer base and the masses of precious data it generates. In turn, this allows the startup to hone and improve its AI, making it an even more attractive partner for customer-facing corporates. One such collaboration is that between Indonesian chatbot developer Kata.ai and Telkomsel, the mobile network subsidiary of Telkom, the country’s biggest telco. “We can see amount of data they’re collecting… and their business is growing in double digits each year,” said Kata.ai co-founder and CEO Irzan Raditya. With this huge number of customers comes a huge amount of interaction with them, a whole load of admin work – and, inevitably, more than a few complaints. Kata.ai’s AI-driven chatbot can handle much of this work for Telkomsel, allowing the network operator’s employees to focus on those issues that require a human touch. 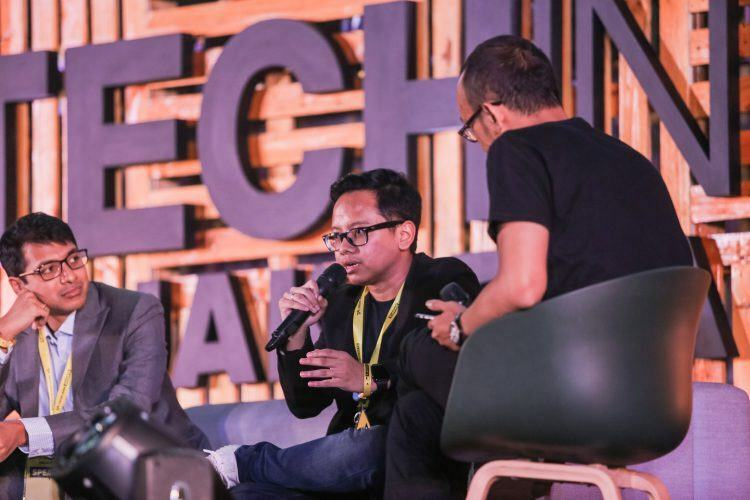 Kata.ai co-founder and CEO Irzan Raditya speaking onstage at Tech in Asia Jakarta 2017. Photo credit: Tech in Asia. Beyond organizational efficiency and improved customer engagement, Kata.ai’s chatbot also has the potential to open new revenue streams for Telkomsel. “They could never monetize their channels on Instagram, Facebook, and so on,” Raditya explained. The chatbot makes it more feasible to sell packages through social media and website interactions. Another way of leveraging a larger dataset is to roll out your AI tech in big markets. And Indonesia is as big as it gets in Southeast Asia, accounting for about half the region’s total population and with a widely variable demographic make-up. Nevertheless, there are a few significant obstacles to overcome before Indonesia can fully begin to unlock this potential. One key challenge is access to talent, Chitturu said, though he added that this seems to be a global problem. “Even companies in the US are struggling,” he said. “Because there is a very limited number of data scientists, and they’re very expensive. Sansan – a Japanese startup that uses AI to digitize business cards and create a social network from the data – employs 10 to 15 data scientists depending on how you define the term, said COO Rio “PopEye” Inaba. He suggested that startups might have more success in hooking AI experts if they do more to understand what these specialists are looking for in a job. For Sansan, it’s more about thinking of how to “have a relationship” with candidates, rather than simply looking at what they can do in their day-to-day work. Offering an opportunity to work on something they consider to be new and revolutionary may be even more important to them than the paycheck they can take home. It is one thing to capture data, but another to make it available to everyone.